I may have only played Battlefield: Bad Company 2 and Killing Floor for any serious length of time this year, but I've still had heaps of epic moments. Bad Company 2 is soaking up most of my time right now, but Killing Floor, with its mix of zombies and big guns, is still the favourite overall. It's basically a mix of Counter-Strike and Left 4 Dead. You earn money by killing enemies, and then use it to buy more weapons and ammo. You can level-up over time too, becoming more deadly as you progress. 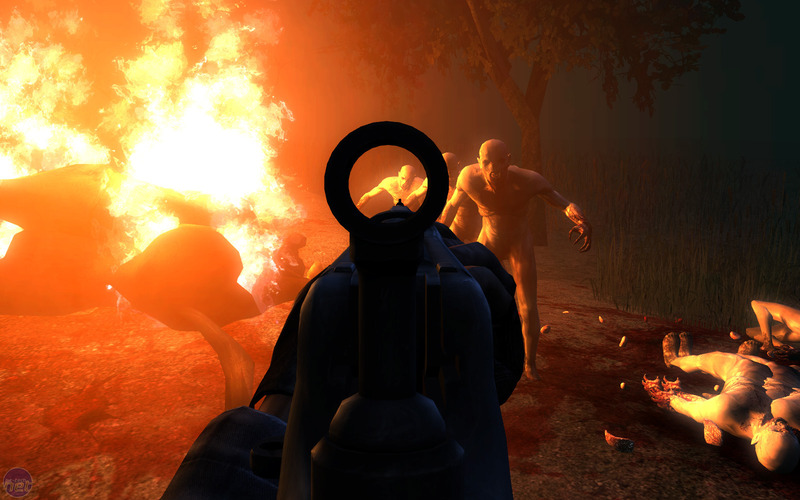 After all, you'll need to be as lethal as possible to survive an encounter with Killing Floor’s cast, which includes enemies such as the Fleshpound – a huge zombie with mashers for hands. The best feature of the Fleshpound is the way in which it flies into a rage when you shoot it, making it close to unstoppable. At higher levels, you really need to have a strategy if you want to stand a chance of defeating the enemies. One of my favourite levels in the game is Wyre; a forest-covered hill with a large fort. Standing on top of the fort is one way to beat the hordes, firing down with rifles and grenade launchers. However, in my favourite match of the year I followed the team into the dark, eerie and cramped tunnels beneath. We held up in a long corridor with two men covering the entrances at either end, and then the assault started. The next ten minutes were an awesome hail of bullets, grenades, fire and smoke as we blasted anything that moved. It was essentially a turkey shoot until the bigger zombies showed up, at which point one end of the tunnel lost a defender. Worse, before I could react, a Husk appeared and sent another two players packing. I reloaded and fired my M32 grenade launcher until it ran dry, at which point I was left with only my Desert Eagle. I searched through the clearing smoke to try to confirm the kill, when I spied a red light and heard a scream – the Fleshpound was in rage mode and charging straight at me. There was nowhere to retreat to, so I just stood and fired, feeling like Tom Hanks in Saving Private Ryan as he fought a tank with a pistol. I was on my last clip and the Fleshpound was at point blank range when I scored the winning headshot, bringing the creature to its knees just a few centimetres from my feet. I may have been under the hill, but I felt on top of the world. If you listen to the games podcast then you’ll know that I’ve only just finished Mass Effect 2, so you may be wondering what took me so long. Why did I wait so long to play Mass Effect 2? A part of the reason was wanting to throw myself into Dragon Age: Origins, which I tried to like but found myself detesting. Trekking around Fereldan and slogging through seemingly endless dungeons bored me so much that I thought I couldn’t handle another RPG – and that’s from a Baldur’s Gate veteran too! Fortunately, I found Mass Effect 2 to be a completely different experience. From the moment the game starts, Mass Effect 2 inspires emotional reactions – should I make sure Liara gets out safely? Can I use the destruction of the Normandy as a chance to finally kill off that irritating pilot? As the story continued, I found myself more and more absorbed, and this is what an RPG should do, rather than forcing you through lengthy dungeon crawl after lengthy dungeon crawl. With highlights such as Tali’s loyalty mission – a creepy search through a semi-derelict research ship – and Archangel’s excellent siege sequence, Mass Effect 2 had me hooked throughout. Everything culminated in the dramatic final mission, where you have to choose what role each crew member will play in your assault on the Collector base. You have to choose tech specialists for hacking tasks, for example, and this is where I blundered. Tali, as she helped to seal a blast door, caught a round in the head, her head snapped back and her body thudded lifelessly on the floor. I was gutted. Mass Effect 2 highlights an interesting dichotomy in what I want from a game. There are games that challenge you to beat them, and there are games that are played for the experience. I’m much more interested in the latter, and Mass Effect 2 is a prime example of a game where failures become a part of the appeal. Filmmaker Wade Savage has announced plans to create a fan film investigating the origins of Legate Lanius.